A medical student encourages her peers to inspire youth from diverse backgrounds through pipeline programs. Heval Kelli, MD, (bottom right) poses with participants in a pipeline program at Clarkston High School in Atlanta. Quickly, I was peppered with questions. “What does it feel like?” “What were you doing when it started?” “Did it travel down your arm?” We also went through a full history and physical exam and pored over chest X-rays and EKGs. In short order, the group debated possible diagnoses and agreed: I was having a heart attack. As an instructor in the Young Physician’s Initiative (YPI), I was heading one of the interactive sessions that this community-based program offers high school and college students in under-resourced communities. Through year-long programs, YPI sends Emory University School of Medicine students to schools whose students have expressed an interest in medicine. We share patient cases and walk participants through how to think like a doctor. We also offer insights into the admissions process, so participants can better understand the medical field and — perhaps even more important — how to get there. If this country is going to provide quality health care to all, we need to draw more young people from diverse and underrepresented backgrounds into careers in medicine. Current medical students can be the ones to help make that happen. I recall how, during my first year of med school, the chief of cardiothoracic surgery talked to my class about his specialty and shared a slide of the department’s faculty. I looked at the rows of faces and was dismayed that there wasn’t a single person of color. Despite gains in recent years, the statistics on underrepresented groups in medicine remain disheartening. A mere 734 African-American matriculants entered medical school in 2018, for example, and the number of American Indians and Alaska Natives was a slim 218. Given that our work touches the lives of every ethnicity, social class, and religion, our workforce should better mirror the diversity of our patients. If this country is going to provide quality health care to all, we need to draw more young people from diverse and underrepresented backgrounds into medicine. Current medical students can be the ones to help make that happen. I also recall that when I was an undergrad toying with the idea of medical school, the most valuable information came from friends and mentors who were medical students themselves. They were the ones who could provide the unfiltered truth about what medical schools looked for and what pursuing medicine was like. They suggested classes I should take and advised me to shadow physicians and participate in medical research. And they made the idea of becoming a doctor seem feasible, serving as the spark that set off the chain that brought me to where I am today as a third-year medical student. But what about the many young people who don’t have friends or relatives to offer that crucial guidance? This is where medical students can step in. Our premed experiences are recent enough that we understand the challenges of trying to enter the world of medicine, and we have taken enough steps forward to reflect on our journey through the entrance. We can share what we did well and what we would have done differently, such as the gap year we’re glad we took or the college resources we wish we’d accessed earlier. And, hopefully, we can inspire students who are not much younger than we are. Like various other pipeline programs across the country, YPI relies on medical students to enrich participants’ experience. YPI was pioneered by Emory cardiology fellow Heval Kelli, MD, who, after delivering a graduation address at his alma mater, Clarkston High School, received emails from students seeking help pursuing careers in medicine. Kelli was moved to find a way to offer them support like he'd received on his journey from being a Syrian Kurdish refugee who washed dishes in a restaurant to being a doctor. After years of being on the learner’s side of the classroom, I find it energizing to lead a group of curious students. It lets me turn the many hours of studying into something that puts a smile on someone else’s face. 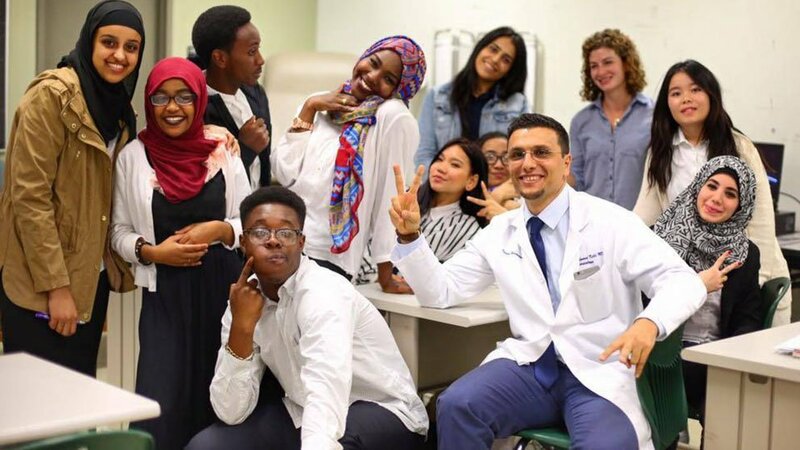 In 2016, together with medical student Hannah Williams, Kelli launched a pilot program at Clarkston, where the majority of students come from minority, immigrant, and refugee families. Today, the program reaches 120 students at four high schools and Georgia State University. How does our program work? Each month, groups of 10 to 15 participants meet for an hour after school to learn how to diagnose common diseases, listen to physicians describe their jobs, ask questions about the admissions process, and practice doing what real doctors do, like triage emergency medicine scenarios. They also have the opportunity to volunteer at a health fair or community clinic. So far, the program is reporting successes. After YPI, 85% of surveyed participants were interested in becoming a doctor and 95% reported that YPI helped them understand the process of becoming a doctor. What's more, the faces I see in YPI also give me hope that the next generation of providers will include people who are the first physicians in their families, who come from other countries or underrepresented minorities, or who have nontraditional life paths and experiences. These students can enrich the halls of medicine. They just need a little help getting through the door, and that help should come from those of us fortunate enough to already be there. YPI has also been a rewarding experience for our medical student volunteers, and I encourage my peers across the country to join similar programs — or to urge their school to create one. YPI gives med students an opportunity to practice leadership, as one year’s volunteers train the next year’s group on how to run sessions. After years of being on the learner’s side of the classroom, I find it energizing to lead a group of curious students. It lets me turn the many hours of studying into something that puts a smile on someone else’s face. Julia Xia is a third-year medical student at Emory University School of Medicine and an instructor in the Young Physician’s Initiative in Atlanta. The opinions expressed by the author do not necessarily reflect the opinions of Emory University or its members. Young Physicians Initiative is a community-based volunteer program.